The Progressive Gazette: What Drives The West's Self-Destructive Belligerence? What Drives The West's Self-Destructive Belligerence? "Europe whole and free" and the "reconstruction and enlargement" of Europe. That is how the corporate-funded Atlantic Council - NATO's defacto public relations front and think tank - is describing the current agenda of the "transatlantic community" during their celebration of the "25th anniversary of the fall of the Berlin Wall, the 15th anniversary of NATO's first post-Cold War enlargement, and the 10th anniversary of the "big bang" enlargements of both the European Union and NATO." 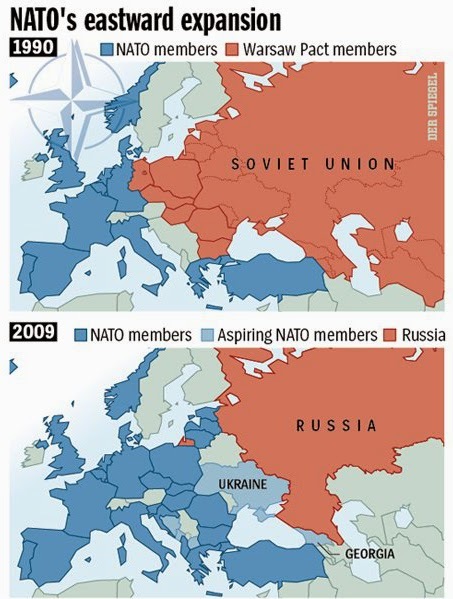 Readers might notice that the EU and NATO's "big bang" enlargements occurred long after the Cold War ended - in other words, long after NATO's alleged reason for existing expired. Yet it not only continued to exist, it in fact expanded and continues to expand to this very day. Its presence in Ukraine and Georgia via proxy regimes installed through now admitted US-backed subversion is reminiscent to Nazi Germany's aggressive pre-war expansion. Russia then, as it does now, realized that with Nazi Germany nearing its borders, buffers against what was an existential threat were necessary. While Russian leader Joseph Stalin was a brute, and his seizure of Polish territory undoubtedly an act of aggression, it was one of several factors that helped slow the Germans down long enough for the Soviets to turn the tide and eventually win the war.